I hate flies. Somehow they get in - whether through a crevice or a door left open, then they show up with that annoying buzzing. It seems they are attracted to bright lights and food. There was a time that I had a tiny hole in the screen of my window. In what seemed to be instant, one fly multiplied into ten, and I was on a rampage. I hate flies. To get rid of flies, I have used towels, shoes, and a fly swatter. When I use the wrong tool, I may kill the fly, but more often than not I damage something in the surrounding area. When I use a shoe, I miss. But when I use a fly swatter, I'm so precise it's incredible. There's something about the length of the handle and the lightness of the swatter that makes it so effective. I feel powerful when I'm eradicating these pests with the right tool. Lies are like flies. Lies get in whether through a subtle thought or a bold-faced lie. Lies buzz around and take on a life of their own. Lies seem to be attracted to our propensity to deny truth and believe a lie. Lies can proliferate until we can no longer discern the truth. 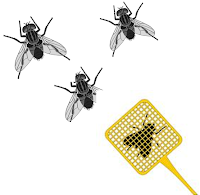 Unlike flies, the buzz of a lie may not always be annoying until you recognize it for what it is. Buzzz.......I'm smart therefore I'm better than all of you. Buzzz.....It's OK to talk about her. Buzzz.....Since we're in a relationship, we can do whatever we want and no one needs to know. Buzzz......I'll buy this dress and wear it with the tags, then return it. Buzzz......type Amen and send this email to 10 people so that you can be blessed. The only way to recognize lies is to know the truth, if not any lie can seem plausible. The best source of truth starts with the Bible as it is the ultimate lie swatter! (John 17:17) As a source of truth, it eradicates lies. It's powerful (Psalm 119:89), timeless (Psalm 119: 137,138), consistent, provides discernment (1Thessalonians 5:21), trustworthy (Numbers 23:19) and provides a standard (2 Timothy 3:16). Using the sword of the word you will feel powerful as you wield it. But use it wisely - be prayerful and wise as you eradicate lies. Study the Word, so that you can recognize the incessant buzzing of a lie and then eliminate it. Lies, like flies, have no power over you. When you recognize a lie for what it is, kill it. wow, great post! Loved how you shared the similarities between lies and flies. And for the record I absolutely detest flies too! When they come in I usher my cat in. He is the best fly killer, haha.